What an honor to return the week after Christmas and fly back to Uganda, Africa! Check out pics and video on our Instagram page. So thankful for my dear friend, Pastor Chuck Balsamo for inviting me to return and we flew together from Dulles (IAD) to Entebbe, Uganda. We changed planes in Instanbul, TURKEY where the recent “Taken” movie was filmed and en route back to Africa I knew the Lord wanted to TAKE BACK souls that the Devil had stolen. We arrived at 5 AM local time and greeted by a film crew from our friends at DREAM TV and they captured us coming out of baggage claim and no one has the kindest smiles than Uganda. They do everything BIG in Africa and Chuck did a great interview on the spot and we were whisked to our hotel. So thankful for all the logistics done by our dear friend Eric Newberry and he worked tirelessly to help make it run smoothly. He has a heart for missions and amazing with administrative skills and blessed by his friendship. God is using him powerfully to touch the world. He has an OPEN MAP and OPEN HEART and that always OPEN DOORS! After a 23 hour flight we had no rest for the weary because after having breakfast I just climbed into bed only to be summons five minutes later that I was invited and expected to speak unbeknownst to me at a Pastors Conference at Victory Christian International with Dr. Hugh Osgood from the United Kingdom. I had spoke there last year but with a change of schedule was not anticipating to speak this year prior to the stadium. With no notes, no sleep and no time to worry I said a silent prayer asking God for strength and to be Spirit Led and blessed to minister to several hundred souls. Their worship is unlike any other and in America we tend to look at our watch after an hour but they worship all day long! The Lord met with us and a violent but much needed rain storm soaked the region while we were in worship and looking back it may have been a sign of God’s blessing raining down on us. As a child I thought rain was bad but as an adult it is a good thing! After nearly two days with zero sleep I finally found a bed to crash for a few hours. It is a eight hour time difference not counting a day’s flight and it can mess with the human time clock. Pastor Chuck Balsamo had an idea to preach a continuation of his message the year before featuring a stuff animal. An engineer from his home church in the states began to build an ensemble that would enable his message to take flight. #Literally Pastor Chuck is one of the most creative, selfless and inspiring guy I know and that brother is brilliant. He got the big stuffed animal on the plane but once in Africa we had to trust God to find a helium tank to blow up 30 jumbo balloons to sail. It had to be exactly 99.9% helium because anything less would not work. After several failed attempts at local stores the team was falling flat! Some of his friends and mentors were advising him that it was impossible. Others said the risk was greater than the reward. Another said you could fail miserably on the largest platform of your life in front of both a packed soccer stadium and live television audience. However, Chuck didn’t listen to the critics but the call God put in him and that was to deliver the Gospel and help a nation take flight thinking their best was ahead and the battle is won and lost in the mind. With the clock ticking, we were at balloon 22 when I was called to speak on the platform and the team continued to work during my thirty minute remarks. As the crowd went wild to hear of God’s love for them I could see Chuck and the guys in my peripheral vision not only cheering me on but completing their task because he was up next. Just in time, Chuck walked on that platform and not only preached a sermon but catapulted a stadium and inspired a nation. You can see that uplifting message on our Facebook page and it is powerful! 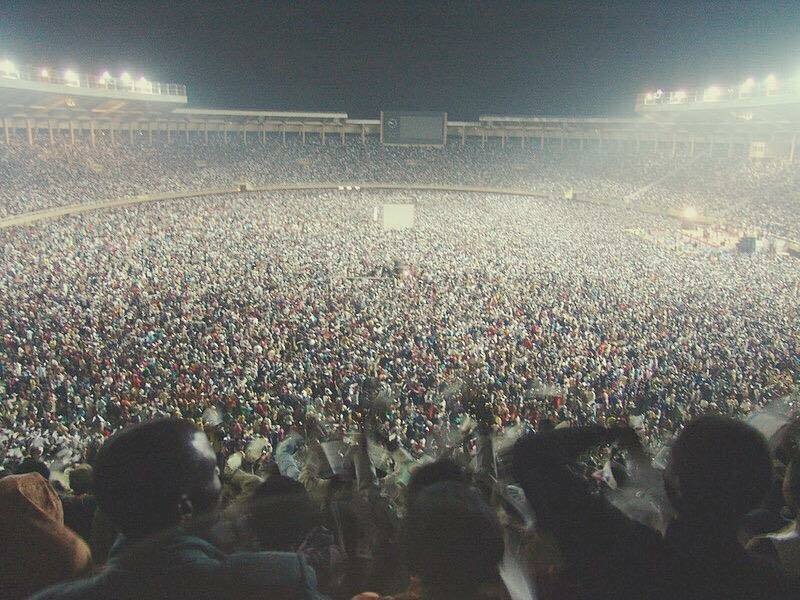 The back story is the President of Uganda ordered on the day of the event to have all television and radio stations air the celebration live to some 30 Million throughout Uganda. As if speaking to over 100,000 was not enough the Lord does above and beyond! When the first set of balloons were attached to the stuffed animal he began to LOOK UP. The weight of those first ten balloons picked up the head of the dog and the crowd loved it. Then when Coree brought out the second batch of balloons and affixed it then it STOOD UP and the stadium was smitten. Then when Eric (team effort) brought the final ten balloons to make all thirty attached to the animal it WENT UP! It took off and the capacity crowd went CRAZY!! As the animal went upwards their dreams and potential did too! Within seconds it was out of the stadium and the cheers got louder as the animal flew higher and then they realized it was symbolic of their identity in Christ. Eventually the animal disappeared out of sight and as Chuck and I were boarding a flight from Uganda to Dubai we got word that it was found NINETY MILES from the stadium! You may start out local but God wants to take you global! In the pic below on far left is my dear friend, Coree Balsamo. Hands down, he is a missionary marvel and he is on mission as much as anyone I know. He is a selfless soldier and he lives for God and loves everyone. #SoGood We have been blessed with such an amazing team and they each individually and corporately have taught me so much about loving, living and giving. In closing, I want to thank all the anonymous friends who prayed for us, put money in the bank and proverbial spiritual gas in our tank to do this mission. Some preach, others teach but we EACH can REACH and together we made a difference. We didn’t just speak to a nation but part of a continent and like that stuffed animal that left the stadium the spirit of Uganda is flying higher than ever. The team may have left Africa but Africa won’t leave us. This was the second sermon I had the honor to preach along with Pastor Clayton King, Pastor Chuck Balsamo & Dr. Hugh Osgood. Over 118,000 were present!